Adam Joseph reports on AccuWeather during Action News at 6 p.m. on April 19, 2019. 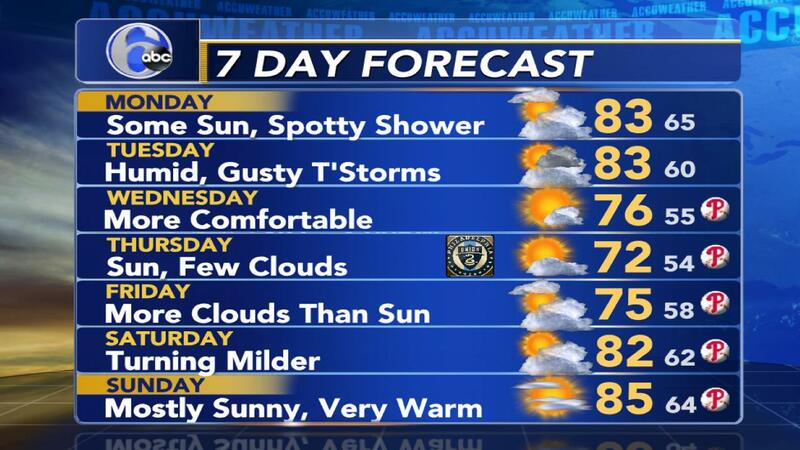 PHILADELPHIA (WPVI) -- TONIGHT: Cloudy, breezy and mild with pockets of rain and thunderstorms. Some of the rain will be heavy at times. A FLASH FLOOD WATCH has been issued for the entire viewing area. Some locations could also see a heavy thunderstorm with strong, potentially damaging winds. Lows 61-63. SATURDAY: Cloudy and damp during the morning with leftover rain and drizzle. Skies will attempt to brighten up a bit during the afternoon. Becoming breezy and mild. High 73. SUNDAY (EASTER): Clouds, some sun. An isolated shower is possible. High 67. MONDAY: A period of rain is likely during the morning. Otherwise, mostly cloudy and fairly mild. High 70. TUESDAY: Partly sunny, breezy and very warm. A shower is possible late in the day. High 81. WEDNESDAY: Partly sunny, seasonable. High 70. THURSDAY: Mostly sunny and cooler. High 68. FRIDAY: Partly sunny and warmer. High 73. For weather updates wherever you go, please download the AccuWeather app.